every year, friedrichshafen hosts a large gathering of rare and old cars at the local exposition halls. a remarkable collection it is, but one part is reserved for alternative and electric propulsion cars. this part is called e-mobility world. 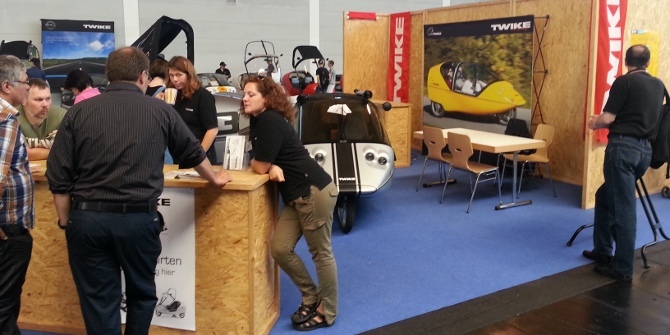 this year fine mobile, the TWIKE manufacturer decided to take part and have a large presence there. 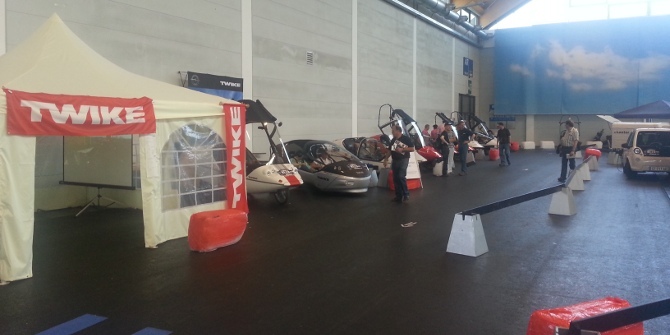 all TWIKE pilots were invited including access to the halls with their own vehicles. i drove the 100 kms to friedrichshafen in one charge. a very nice drive given the wonderful weather. lake constance, nestled between germany, austria and switzerland is a very nice region. every time i get here i think it would be a treat to spend some time here, but alas, i somehow don’t get around to do it after all. it is a very cool feeling to be able to drive into the exposition hall and have my own vehicle be part of an ever-changing display of real-life electric vehicles being used on a regular basis. fine mobile’s stand is HUGE! all staff is present and it was nice to see them again after my visit just a few weeks ago. 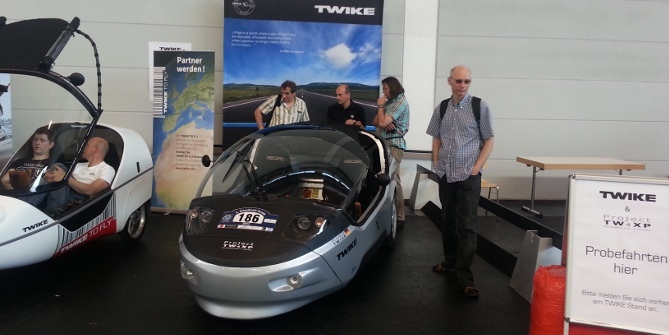 as usual, the TWIKE4 prototype is center stage and with test-drives available, always somewhere driving inside the hall or outside on the large test area the organizers set aside for tests drives. i didn’t envy wolfgang möscheid, brother of martin, fine mobile’s ceo. sitting in TWIKE4 for the better part of the day answering the same stream of questions over and over again. 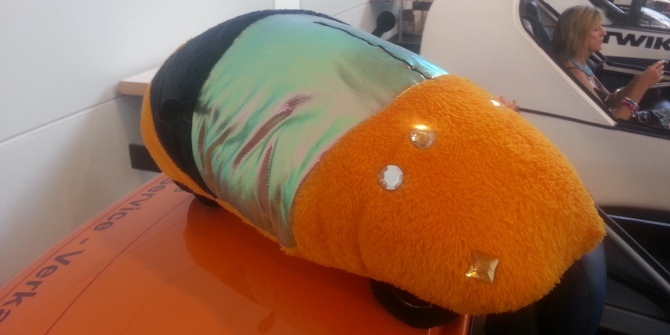 new vehicle usage concepts, such as TWIKE2fly, were presented. TWIKE2fly is a concept where you either are TWIKE pilot or get your pilot’s license after a standardized introduction and then get a TWIKE to drive (…fly, we’re pilots after all) wherever you are. first active partner silvia brutschin (a.k.a. 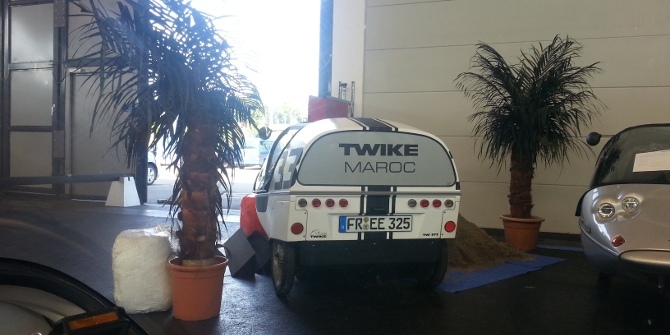 twikezora) is in a far-away place as agadir, morocco and i am sure looking forward to travelling there sometime soon and being able to TWIKE across morocco without needing to actually get my own TWIKE there in the first place! there were others there, too. 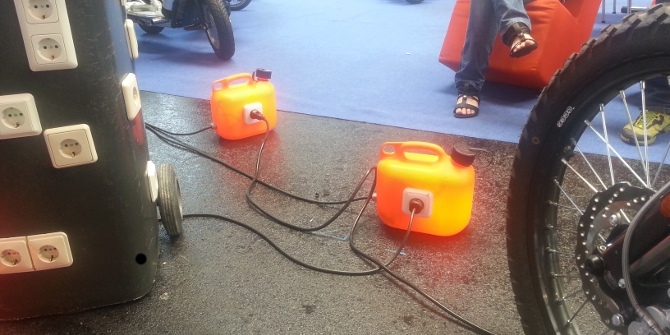 one of the noteworthy ones was performance-electrics. a group of perfrormance artists embracing electricity and energy distribution as their art form. all over the hall active installations were to be seen. very interesting indeed! 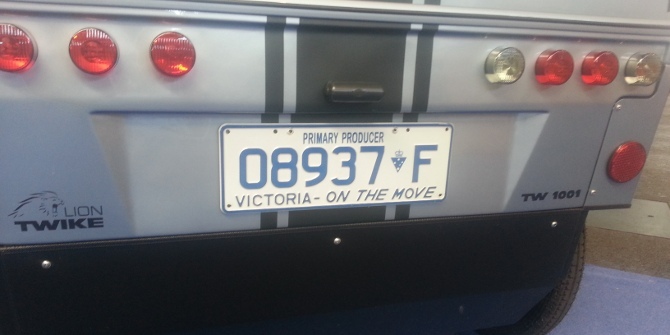 for the connoisseurs, fine mobile had some goodies lined-up: first of all, TW1001, ready to be shipped to new zealand! 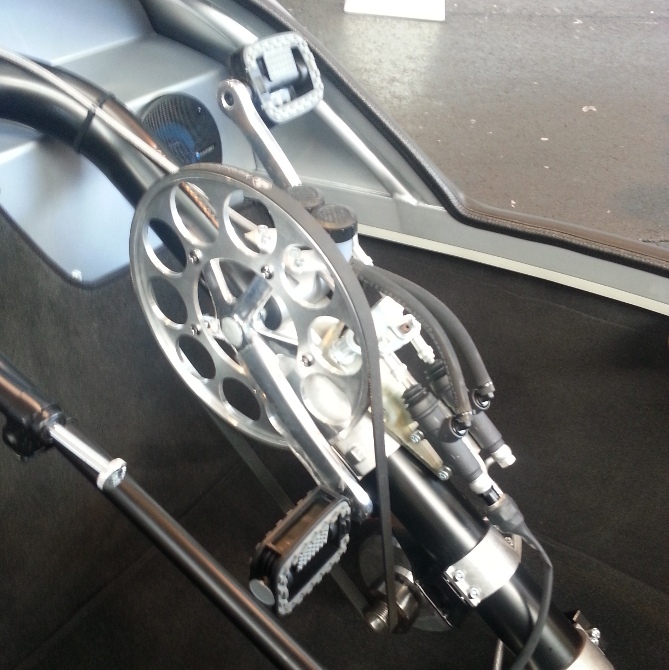 but even more interesting was the fact, that even if it was not explicitly announced, fine showed off a technology preview of a TW5 option: pedal generators – a radical change to the current direct drive system! 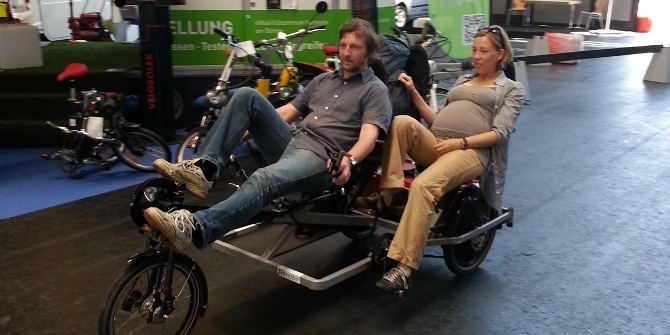 new TWIKE model > keep a TWIKE close even when you’re away from a road! 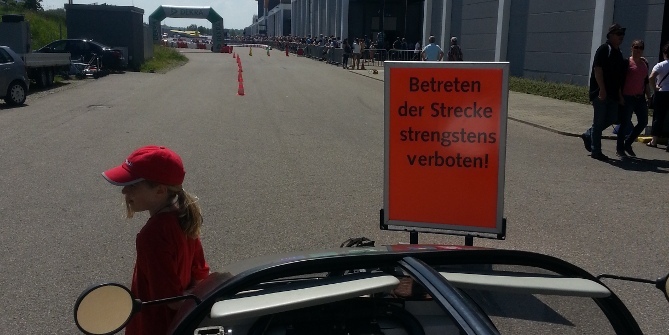 we were pleasantly surprised that we were invited to race all other electric cars around the track just outside the fair. 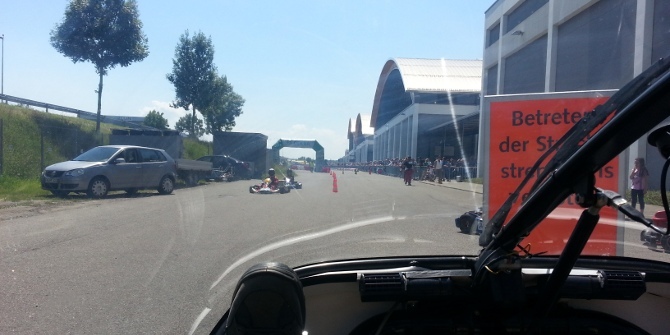 TW560 was one of the first vehicles – we just had to wait for a group of go-carts to finish their laps and off we went! it’s going to be our turn soon! i already knew TW4’s legendary acceleration, but check out how this next-gen electric car overtakes us at about 0:40! it allways pays to take part in electric car events – racing around a race track with TW560 and TW4, seeing all the usual suspects and many promising products… i’m looking forward to the guinness world record attempt july 6 in zurich: gather as many electric cars as possible at the same place – let’s see how many actually make it to zurich > 254 vehicles seem do-able!